When Rosemarie Rossetti moved into her new home on Friday, she effortlessly guided her wheelchair from the van through the front door of the Gahanna-area house. That simple act is the culmination of 14 years of frustration, dreams and persistence. The home Rossetti will share with her husband, Mark Leder, is more than just a stately prairie-style residence. 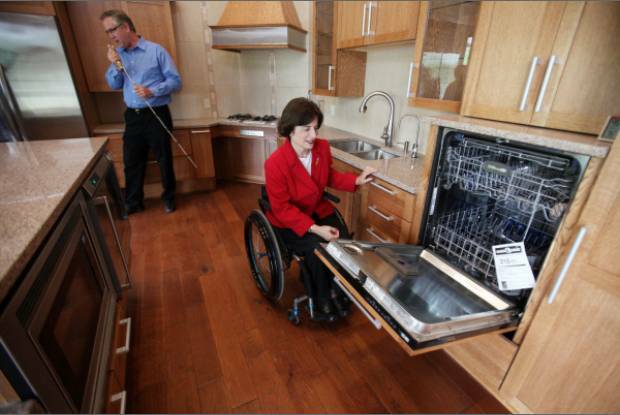 It serves double duty as the Universal Design Living Laboratory, showcasing features that make a home accessible to those with a wide variety of abilities.Rossetti, 58, and Leder, 54, came up with the idea after a tree fell on Rossetti in 1998, putting her in a wheelchair. After trying to modify their old two-story home and failing to find a new home that met their needs, they enlisted the support of donors and broke ground on this home in September 2009, hoping to move in the following summer. “For a nine-month project, this sure has taken a long time,” joked Rossetti, a motivational speaker and writer. Three years, $1 million and 182 corporate donors later, the home is finished. What started as an exhibit of handicapped accessibility morphed into what might be the most technologically sophisticated home in central Ohio. “The home is state-of-the-art. It’s 2012’s best — very, very best,” said Robert August, a 40-year veteran of the housing industry who runs North Star Synergies near Denver and served as a consultant to the project. From simple features such as barrier-free showers and motion-sensor lights to fire-suppression sprinklers and a massive air-handling system, the home is a showcase of contemporary home-building technology. Some of the features are quirky, such as a pasta cooker recessed into the kitchen counter, 4-inch-deep pantry shelves and a stove with a door that opens sideways. Other features are simple but huge for those in wheelchairs: wide doorways and halls, lever door handles rather than knobs, kitchen and bath sinks that allow a wheelchair to slip under, pocket doors, an elevator, raised garden beds, barrier-free access to the outdoors, multiple-height kitchen counters, and a massive closet/laundry room combination that can be navigated by a wheelchair. Other features were driven more by the couple’s desire to own the first privately built home in central Ohio to be certified as a Leadership in Energy and Environmental Design (LEED) home. The home has already been designated a green building by the National Association of Home Builders.The home’s green features include structural insulated exterior panels instead of wood studs, a factory-made concrete-and-foam basement wall system, solar panels, permeable pavers in the patio that allow rain to pass through and LED lights throughout the home. Finally, there are the features rarely seen in even custom homes: rubber matting under hardwood floors to provide cushion and soften sound, sound-deadening drywall in the master bedroom, and a custom stained-glass ceiling over the library. Perhaps the most unusual feature of the house is that it doesn’t look so unusual. The home includes 3,500 square feet in a single story, with a full basement, much of which will be finished. The heart of the home is a cavernous two-story great room that can host large gatherings. The main floor also includes a master bedroom, a guest bedroom, offices for both Rossetti and Leder and a library alcove off the great room. For Rossetti, the home signals triumph but also liberation. “I no longer have to ask Mark to help because I can’t get something or can’t do something,” she said. After landscapers complete the exterior work and Rossetti and Leder finish moving in, the couple plans to open the home for a month for tours to raise money for spinal cord research at Ohio State University. After that, they will continue to open it for special events and tours to architects, designers, manufacturers and others in the home industry.Rossetti and Leder don’t know how often companies or individuals will want to visit the home, but allowing that access was essential in attracting donors to the project. “It would ordinarily be harder (to enlist donors for a private residence), but these companies have the right to come back there anytime if they give Mark and Rosemarie notice,” said consultant August, who helped sell the project to companies. Rossetti, Leder and others involved in the project hope companies continue to use the home as a laboratory for new products. They want the home to become a catalyst for change in the homebuilding industry by showing all the possibilities in “universal design,” a style of building that accommodates those of varied physical abilities. While the home’s array of features pushed the cost to an estimated $1.1 million, Manley and Rossetti say they hope visitors realize they don’t need all the features to make a home more functional for those with physical limitations. Many elements of universal design — such as wider doorways, lower countertops, lower light switches and roll-under sinks — don’t add much cost to a new home as long as they’re planned from the start. “Some people will be critical of the expense,” Rossetti acknowledged. “But much of this is replicable in a Habitat for Humanity home, a small 900-square-foot home. The same principles can be used across the spectrum from low-budget public housing all the way to luxury custom homes.”The construction took far longer than a conventional home largely because the couple relied on donors for much of the cost. While some of the biggest contributors — Classic Metal Roofing Systems, Cosentino, Florida Tile, KraftMaid, Kohler, Marvin Windows and Doors, and Whirlpool — were consistent with their support, other support evaporated when the economy took a nose dive. Also delaying the project was the push for LEED certification, which required considerable documentation and inspections, and some unconventional building processes. No Dumpster was used on the site, for example. Excess building materials were donated or recycled. Even workers’ food wrappers were separated for recycling. “I was speaking at Walt Disney World (on) May 1 and while I was there I saw an ad from Disney saying ‘Where Dreams Come True,’ ” Rossetti said.